Going to the vet can be a scary thing for many of our dogs. But there are things that we can do to make the whole process less intimidating. This is even more so if your dog requires to be hospitalised or have procedures performed such as blood samples, biopsies or imaging. #1 Don’t be overly keen to rush the process. Break everything down in to small, manageable and bite sized bits. Take your time. And ensure your dog is a willing participant in the preparation process. #2 Crate and Mat train your dog. Being able to take your dog’s mat with you, will give your dog a safe place to be wherever they are in the clinic. This could be the waiting room, the consultation room, and the hospital cages. The mat will also give your dog a secure footing, and the fear of slipping on the smooth tables (designed this way for hygiene and cleaning between patients) will be lessened, without decreasing the ability to disinfect the table prior to the next patient. Make sure the mat you take is also washable, and that you can clean it easily when required (if your pooch is sick and has vomiting/diarrhoea, or has had surgery and there is any bloody discharges etc.). Likewise, teaching your dog to enjoy crate time, and have a default crate = chill, will make any hospital stays less stressful for your pet, you and the veterinary staff. #3 Scales – OMG! The number of dogs that are convinced the scales are going to kill them or must be a bottomless pit is phenomenal. Teaching your dog to step up on to a slightly elevated, flat surface, and remain still for 10 seconds will be a huge help. Use a wooden pallet, upside down clamshell pool, cushion etc. Teach your dog a hand target and play a game to get them on and off the fake scales, and if you live close enough, take your dog for practice visits where nothing bad happens. They get in, sit on the scales, get a reward and are able to leave. The handy bit (get it) about using a hand target, is that on the day that you may need to weigh your pet, they may be fasting, and this is a way to get them on the scale reliably, especially if this has been practiced a lot prior. #4 Elizabethan Collars/Cloud or Cushion Collars. 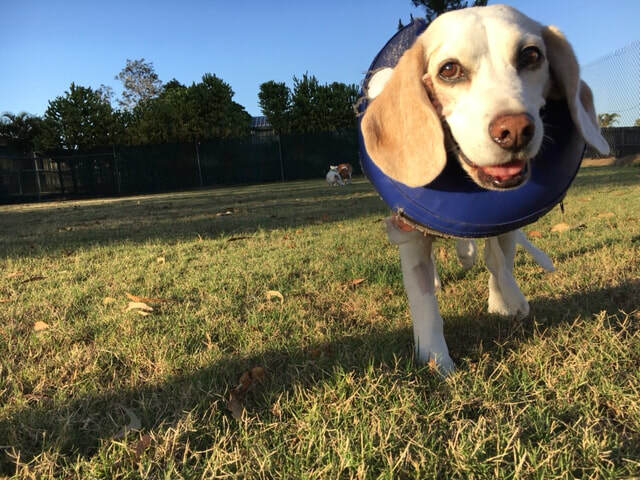 What if your dog has surgery, or needs to be prevented from rubbing an infected ear, ulcerated eye or chewing at hot spot? Teaching your dog to comfortably wear an Elizabethan collar or cushion collar (hey go for both to be honest), prior to needing it, will be one less stressful thing for your pooch to have to learn should it be needed. My guys are so well conditioned to collars etc., that if I leave one lying around, you can take a bet, a dog will soon present itself wearing one. The same goes for muzzles. 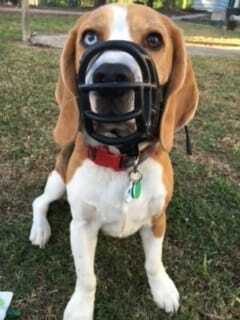 Muzzle training is incredibly useful, and should be taught to ALL dogs prior to them ever needing one. It is also incredibly useful if your dog ever requires an oxygen mask etc., as the feel of something over their snout will not be foreign. #5 Practice Restraint. 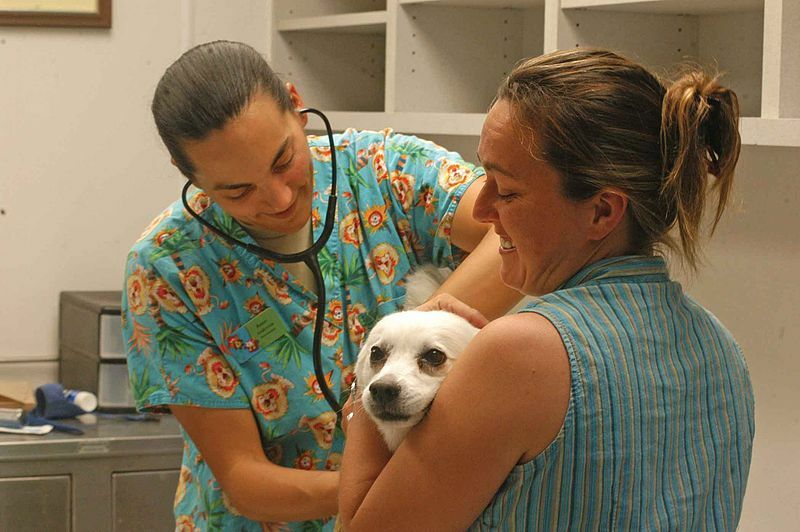 Pets will require restraint at some point during a veterinary visit/procedure. So teaching them this is invaluable. Some dogs will panic if they have never had this type of thing done prior. For blood sampling – blood is usually taken from the jugular vein (so teaching your dog to raise their head and look at the ceiling), the foreleg cephalic vein (teach your dog to be held into your chest, with your left arm under their neck and around the back of their head, and your right arm, over their back and side of chest, with your hand holding their right foreleg – thumb over the top of the leg, and their elbow sitting in your palm – or vice versa for the opposite side), or a lateral saphenous vein (with your dog standing or lying on its side, hold the leg from behind between their knee and ankle. You should see a vein raise over the point just above the ankle). 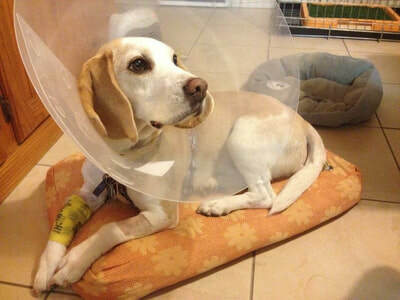 Dogs may also need to be restrained on their sides or backs for procedures such as ECG’s, ultrasounds and x-rays. Teach your dog tricks that involve laying on their side or rolling on to their back. The key though, is to reinforce stillness and calm at the same time. Other things to consider is that your dog may be required to be lifted. This can obviously be scary for a dog that has not experienced this before. Depending on the size of your dog they may be lifted with one person, or two. Do some research and talk to your vet. Practice lifting your dog (you may need the help of a friend or family member), and be sure that you follow WHS and protect your own back while keeping your dog safe and secure. Reward reward reward. Remember when putting them back down on the ground to make sure all 4 feet are on the ground before letting go. It is also worthwhile exposing your dog to heights (waist high) as long as it is safe to do so. This can obviously be scary for some dogs and should be something you build up to. Reward for calm and stillness. #6 Noises and Equipment in the veterinary clinic can also be scary. There are a lot of machines that go Bing, as well as noises from clippers etc. Use an app such as Sound Proof Puppy to expose your dog to these novel sounds, however remember to pair them with good things. Also expose your pet in a positive light to stethoscopes (you can buy cheap ones on eBay or even a child’s toy will do), lights for looking at eyes and ears etc and nail clippers as well. #7 Build your relationship between your vet and pet. Take the time to allow your Vet to make deposits into your dog’s trust account. This is critical, you can do all the other prep work you like, but if your vet and pet really don’t see eye to eye, neither are going to have a great experience. Talk to your vet and tell them your concerns if you have any. Use lots of reinforcement with your dog when at the vets, and have your vet give your dog a favourite treat or a quick game of ball (providing the game does not over arouse your dog and make calm difficult afterwards). 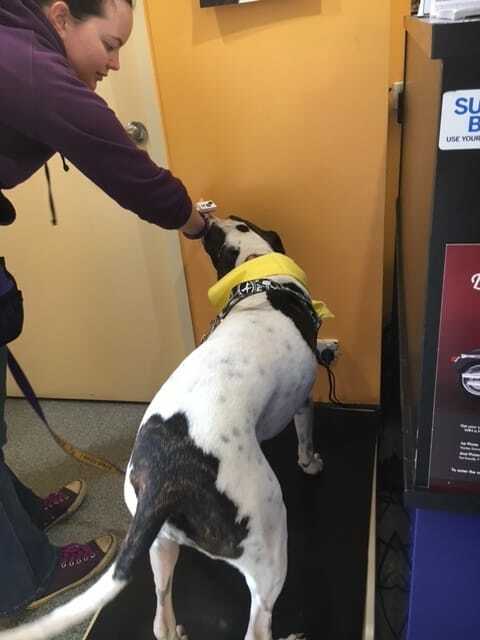 If your dog is going in for blood tests, perhaps consider booking a consultation prior to have a run through and good experiences between your dog and vet without anything necessarily happening. Remember though, if you are booking their time, you should also pay for their time. #8 Stress relievers. There are things that you can do that may help reduce stress for your dog. These include ADAPTIL which is a synthetic copy of a pheromone that mother dogs produce to calm their pups. You can buy this as a collar which lasts for one month and must be fitted firmly, or as a spray which you can spray onto a bandanna or thundershirt and will last 2-3 hours. Thundershirts are tight fitting jackets with help reduce stress by providing pressure. Also, if your dog is stressed and your vet suggests medication that can reduce the stress or sedate them for a procedure so that they don’t remember, I highly recommend you consider this as an option.